It's a scenario that has happened so many times before: you're suddenly in the dark (and we don't mean metaphorically.) Either someone turned the lights out on you (childish prank) or the lights mysteriously went out by themselves (slightly scary.) No matter the reason, illuminating your way into the light would be extremely helpful. (You have no idea how difficult it is to complete the simplest tasks when you're in the dark; nevermind, you probably do.) This is the very reason why we're so enthralled with the fox head lite. It not only encases your head in a fluffy fox hat, but its eyes also light up so you'll never be shrouded in darkness ever again. It's a beacon of hope for headgear everywhere. The one-of-a-kind fox head lite is easily adjustable because of a hook and loop fastener featured in the back, so its ideal for ages 4 and above. Basically, the fox head lite is for everyone. The eyes are fully adjustable as well and once 2 AA batteries (not included) are inserted into the hat, the eyes light up. 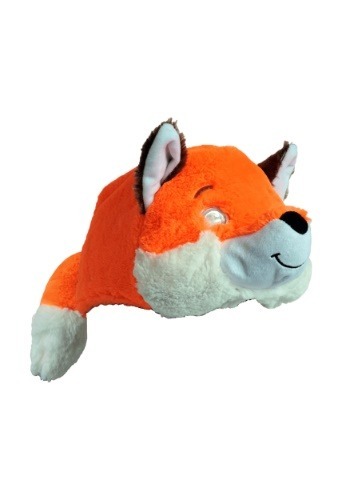 Add this fox head lite to any orange outfit to construct your very own unique fox costume!